To celebrate our 3rd year, Wellness4Every1® founder, Alison Rootberg and ambassadors Hanna Cetkovic and Nimbe Juarez kicked off our 2019 fundraising campaign by running the New Orleans Rock 'n' Roll Half Marathon to raise money for arts and wellness programming in Chicago Public Schools. Every $4 sponsors 1 student for a 1 hour class. We host monthly fundraising events in Chicago and hope to continue to expand our programming each year. In 2018, we taught over 5000 students in 50 schools. With your help we'll be able to reach more students. Donate today! On August 17th, Team Wellness4Every1 (Alison Rootberg, Hanna Cetkovic, Jennifer Lutenski, and Julia Lynch) will be running the SeaWheeze Half Marathon in Vancouver. As we expand to more schools, we truly appreciate your support! 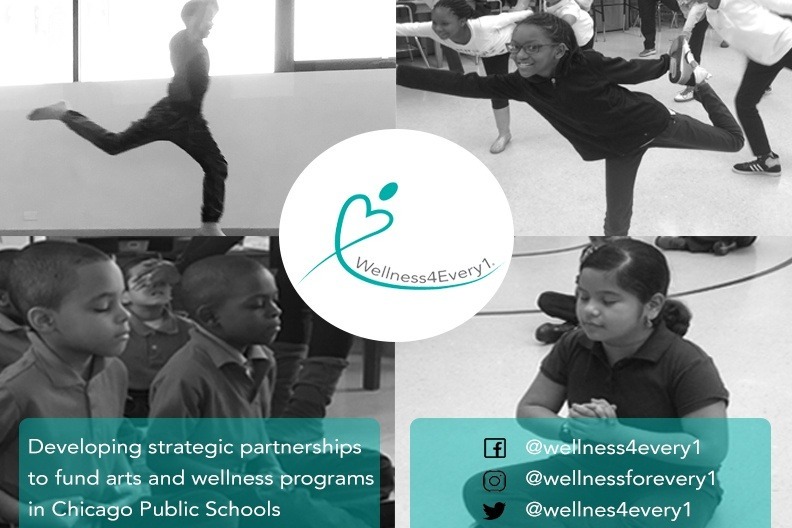 Wellness4Every1® was founded in 2016 in response to the many Chicago Public Schools who had lost their funding for arts and wellness programs. Through community partnerships and fundraising efforts, the organization helps bring these vital opportunities back to Chicago students.